where ρini corresponds to the initial projected density and vini to the initial velocity field. In one dimension, the dynamics of such a system corresponds to the gravitational interaction between parallel infinite elementary planes of collisionless matter moving along axis x. It is straightforwardly and exactly solved by the linear Lagrangian solution (section 2), as long as shell-crossing does not take place (see, e.g., Novikov 1969). Here, we focus on the multi-stream regime, which is more problematic. In Colombi (2015) and Taruya & Colombi (2017) we attempt to describe the multi-stream flow with a Lagrangian perturbative approach modelling the system shortly after collapse, by taking as an initial condition the state of the system at collapse time. While Colombi (2015) focuses on the dynamics of an isolated structure in empty space in a standard physical set-up (section 3), Taruya & Colombi (2017) extend the calculations to the cosmological case in a periodic box (section 4). In the latter case, it means one still considers infinite planes interacting gravitationally with each other, but inside a three-dimensional expanding universe following standard Friedmann-Lema�tre dynamics. where a, b and c are positive numbers, here a=1, b=2, c=2. This property is in fact always true in the vicinity of the singularity (here, q=0) as long as the density field is smooth, non degenerate, and can be locally expanded in a form given by equation (1) above. which are expressions linear in time and cubic in Lagrangian position q. 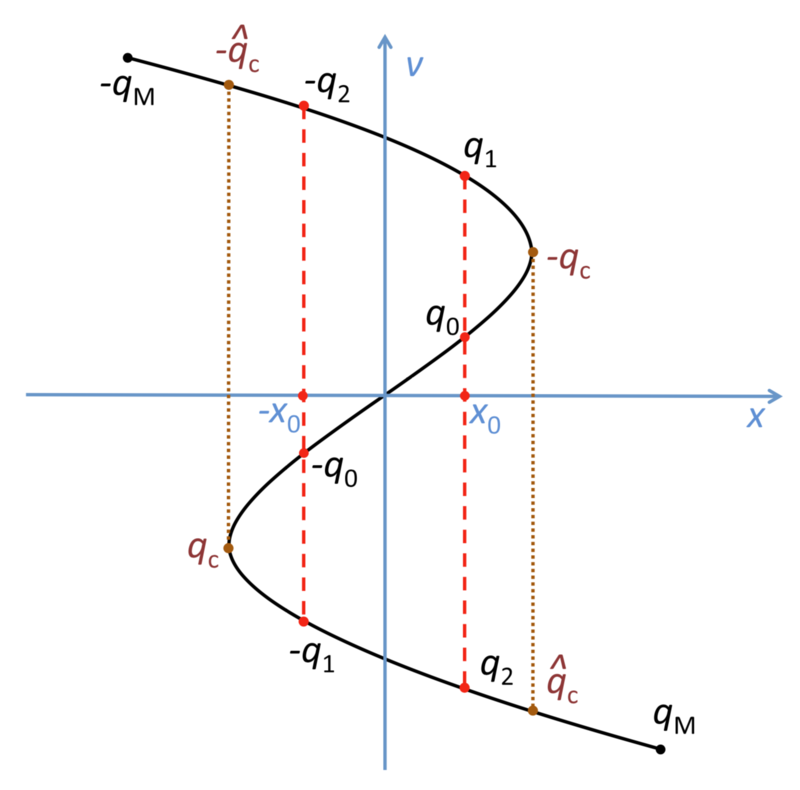 The third order polynomial nature of position (and velocity) allows us to resolve the multiple value problem illustrated in figure 1: to compute the force on a point of coordinate x0 of the S shape, which is proportional to the mass interior to x0, we need to resolve the equation x(q)=x(q')=x0, which can be done simply if x is a third order polynomial in q. Figure 1: Schematic representation of the phase-space structure of the system studied in Colombi (2015) shortly after collapse time. It has a "S" shape, which can be approximated by third order polynomials in Lagrangian coordinate q for the position x(q) and velocity v(q). In this framework, the multiple value problem x(q1)=x(q0)=x(q2)=x0 has a simple solution, which allows one to compute easily the force exerted on point of coordinate x0. This force is simply proportional to the interior mass to x0, i.e. the total mass between the two red dashed vertical lines. Using the ballistic approximation, that is assuming constant in time velocity from the initial condition given by equation (2), one can thus compute the force after collapse time, hence the correction to motion to leading order in time h=t-tc after collapse. In Colombi (2015), we furthermore propose to solve the problem for a more general setup, where the ballistic approximation is replaced with a harmonic oscillator due to a background homogeneous density approximating the contribution of a halo: in this case, the system is the addition of a central S part rotating in phase-space and a slowly growing halo. The central part of the S contracts, while its tails feed the halo. Although conceptually simple, the actual calculation of the correction to the motion is cumbersome, because one has to integrate the force during time and deal with various regimes of the motion. One interesting property of this post-collapse approximation is that in practice, it remains surprisingly accurate until next crossing time, allowing one to iterate the procedure, as proposed and tested in Colombi (2015) using the waterbag code VlaPoly. which is the analogue of equation (3) in the cosmological case. This is the setup we use as our "ballistic" approximation. Note that because this setup corresponds to Zel'dovich motion, it is not exactly ballistic because the velocity is not constant, but this does not affect the procedure: equation (4) is used to extrapolate the dynamics beyond shell-crossing and a correction at leading order to the motion is computed by solving again the multiple value problem illustrated on Figure 1, with some minor differences in the calculation of the force to account for cosmology. Again, because there are several regimes to consider, the actual calculation of post-collapse motion needs several steps involving additional approximations when integrating the force over time. ​Thus, the final expressions for position and velocities, given ​as functions of q and time, ​are slightly intricate. On the other hand, the motion in single valued regions is given, let us repeat it again, by Zel'dovich dynamics. Our formalism is only applicable until next crossing time, but, coupled with the proper adaptive smoothing procedure, can give account of the nonlinear power-spectrum of density fluctuations very accurately, and surprisingly enough, quite far in the nonlinear regime. To test how post-collapse perturbation theory performs compared to the exact solution, we wrote a N-body code, Vlafroid, which also computes all the analytic predictions of our formalism. Figure 2 shows what happens for a sine wave perturbation in phase-space and illustrates the success of post-collapse perturbation theory: it performs quite well until next crossing time, especially for the projected density. Figure 3 illustrates the performances of the method in a statistical way by examining the power-spectrum of density fluctuations in Cold Dark Matter like universes (taking into account the passage to one dimension as in McQuinn & White 2016). With our adaptive smoothing procedure, the predictions given by post-collapse perturbation theory hardly differ from the simulation. Figure 2: Evolution of the phase-space distribution function of an initial sine wave. The simulation (red curves), performed with our N-body code Vlafroid, is compared to predictions from post-collapse perturbation theory (blue curves) and Zel'dovich solution (green dots). On each panel, the lower insert shows as well the projected density. From Taruya & Colombi (2017). Figure 3: Power-spectrum measured in Cold Dark Matter like simulations of one dimensional universes performed with our N-body code Vlafroid (red symbols). Post-collapse perturbation theory is displayed in blue without (thin curve) and with (thick curve) adaptive smoothing. Zel'dovich solution derived from the random fields is also shown likewise as thin and thick green dots. Finally, the solid black line gives the analytic solution for the Zel'dovich solution in absence of any source of numerical bias or noise, while the long dashes provide the linear power-spectrum. Note that adaptive smoothing is performed using the crossing time estimated from post-collapse perturbation theory, even for Zel'dovich approximation. From Taruya & Colombi (2017).